And so he decides to backpack around Europe using only a 1963 edition of the quintessential Europe on Five Dollars a Day by Arthur Frommer that he found at a secondhand book festival in Minneapolis. To add to the retro charm, he also brings with him the postcards and letters that his mother wrote to her fiancé (Mack’s father) during her own Grand Tour in the late 1960s. And that’s it. There would be no Internet research, no competing guidebooks. As much as possible Mack planned to stay in the same hotels recommended by Frommer, eat in the same restaurants, and visit the same sites – although perhaps not on the same budget. On his Not-So-Grand Tour, Mack visits eleven of Europe’s great cities, including Paris, Berlin, Madrid, Rome, and Venice, boldly going “where millions have gone before, relying only on the advice of a travel guide that’s nearly a half century out-of-date.” Setting out on this well-beaten path, Mack’s goal was not to live on $5 a day in some kind of “gimmicky challenge,” but to explore the ways the traditional tourist experience has changed–and hasn’t–during the last fifty years. Just like any traveler, he enjoys some cities more than others (a big fan of Madrid, not so much of Venice). But of course, as Mack travels around Europe, he finds most of Frommer’s suggestions are either closed, have been converted into a giftshop, or serve food so expensive that if Frommer were writing this guide today (adjusted for inflation, of course!) they would never have made the cut. Other differences include Frommer’s choice of seventeen “must-see” cities, which leaves out destinations that are very popular today, such as Prague and Barcelona. And let’s not forget that Berlin was a divided city in 1963. But in 2009, Mack finds the American and East German soldiers at Checkpoint Charlie are now played by Russian and North African actors, demanding tips for photos. Europe on 5 Wrong Turns A Day offers an interesting analysis of the culture of travel, the changes that have taken place since Frommer’s seminal work was published, and the changes that the book caused (e.g. cheap travel as something you could boast about). To flesh out the travel narrative, Mack includes some history of American tourism to Europe, the evolution of guidebooks, Frommer’s success story, and how politics affect the travel decisions of Americans. The book is sweetly charming, with laugh-out loud moments, but it also has some serious points to make about modern travel and the effects of globalism over the last half-century. 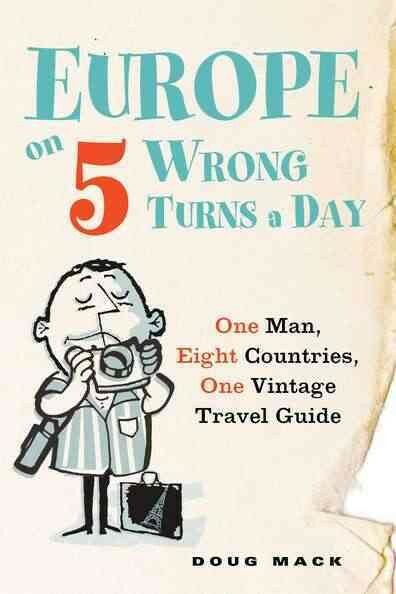 Europe on 5 Wrong Turns a Day is an amusing, self-effacing, and very wry travel memoir, told by an observant and affable narrator. The book is an entertaining mix of social commentary, history, ode to Frommer’s “manifesto for the common traveler” and exoneration of your average, much-maligned tourist.